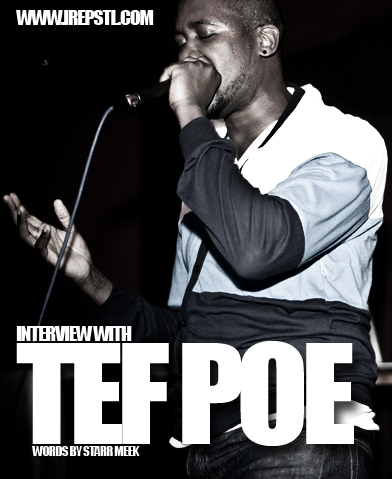 The folks at http://www.irepstl.com sat down with St. Louis’ own Tef Poe for a one on one interview. Fresh off the release of Money Never Sleeps, and a show at this years SXSW, Poebama is set to represent St. Louis on another level. Peep the interview and if you don’t have it, download his project Money Never Sleeps. IREPSTL: Gotta ask the St. Louis question: Where’d you go to high school? TEF POE: I went to Rosary Catholic High School for two years, and then I went to North County Tech. But for some reason when you ask me where did I graduate from, nine times out of ten I’m gonna say Riverview just because that’s the area that I lived in, and I went there for elementary school. IREPSTL: What was the moment that first caused you to say, “I want to rap”? TEF POE:I was up late at night watching a TV show that got canceled, the VIBE show. And they had Rakim on there. And I had never heard of him, to be honest, because we weren’t allowed to listen to music in my house. But I was always sneaking behind my parents’ back and buying CDs and watching videos, doing stuff like that. So I’m watching the VIBE show, and they had Rakim on there, and they were making such a big deal about him being on the show. I honestly didn’t get it because I didn’t know much about hip-hop for real. But when I was listening to them talk about how he was a poet, and he put words together, and how much respect they had for him. Like, they didn’t have the normal amount of respect for him; it was really a big deal that he was on the show. And he performed, and then after that, I was like you know what, I want to do that. I want to be like that. If I can write and motivate people to think like that and respond to what I’m writing, then that’s what it’s about. IREPSTL: I’ve heard you express surprise that, out of all the tracks on your last album Money Never $leeps, the over six minute-long “Church” got such a huge response. Why do you think that this particular song has become so many people’s favorite? TEF POE:I don’t have a clear answer as to why “Church” picked up like that. On my last album I did a very similar song with “When I Ruled the World,” and I think that may be transforming into my thing, like at the end of the album I kind of just summarize where I’m at in life, or just different thoughts in my head, and try to form them into one big universe of thoughts. I remember the night that I wrote “Church.” And whenever I write something like that I get a certain feeling like, something just comes upon me. I sort of just blacked out. It’s really not even me writing, for real. I look back in hindsight and I don’t even remember where those words came from. It’s like dang, I just wrote this. TEF POE:But I think the reason people like it so much is probably just the honesty of it. It’s no holds barred. And there’s a couple things that it touches on that people aren’t used to hearing in rap songs. IREPSTL: You use a lot of religious imagery in your lyrics, and a lot of your songs have strong spiritual themes. What’s that about? TEF POE:I’m a very spiritual person. I think spirituality and music go hand-in-hand. And I believe that using your talents is one of the highest ways that you can honor the Creator. Me as a person, I’m always in search of a deeper understanding of my relationship with God, or my place within the universe, or my place within the grand scheme of things. And what role do I play in making it better? What role do I play in making it good? TEF POE:I was raised in a really religious household, like we couldn’t listen to music, we couldn’t dance, we couldn’t watch certain stuff on TV. At the age of 12 I had read the entire Bible from front to back. My parents asked me what I wanted for my birthday, and I told them I wanted a Bible. So my perspective on religion is a little different than the average person just cuz I’ve taken it and put my own spin on it. IREPSTL: When do your best ideas come? TEF POE:My best ideas come probably after 12 o’clock or like around midnight. It’s like Frankenstein or something. I don’t normally go to bed till 6:30-7:00 in the morning. I’m up all night either writing, listing to music, brainstorming, or just doing stuff that I feel will eventually help me create different ideas or come up with ideas — whether that be watching videos on YouTube about conspiracy theories, or reading some crazy book that I don’t need to be reading that late! IREPSTL: What’s your Clark Kent day job? I mean what does Tef Poe do when he’s not rapping? TEF POE:I’m into a bunch of political stuff. I try to help out the community as much as I can. Because I feel like I can’t just be rapping about causing change without actually living it. So I currently work for a nonprofit organization, through Jobs With Justice, and I’ve been doing that on and off for like 10 years now. TEF POE:[Laughter.] I guess that’s my alter ego. I didn’t realize it, but I’ve formed a second ego, or maybe even and third or fourth, cuz there’s no telling how many I really have. In my mind Poebama is like Malcolm X, like my black power alter ego or my black panther, revolutionary alter ego. Whenever I say Poebama in a song it always follows something like, “wow did he just say that? !” I have another one called “Revolutionary Poe.” Those are just my alter egos, I don’t know, I really can’t explain it. And I don’t say it to be like I’m trying to mimic Barak Obama or anything. I actually thought it was a clever play on the words. And then I started putting it into songs, and people started saying it, and it started sticking, so I was like, well, I’m kinda stuck with it! I mean, “Tef Poe” is just some layered stuff. I think that personality is very layered. It can be one moment where I’m rapping about relationships and about how I messed up a situation with me and a different woman. Or I’m rapping about how I’m trying to change some stuff in my community. Or the next song I might not even care about any of that stuff. I’m just like completely inappropriate, completely over-the-top, completely vulgar. I might even come off a little bit sexist, you never know! Me as an artist, I’m completely unpredictable. There’s no box that I can really fit into. 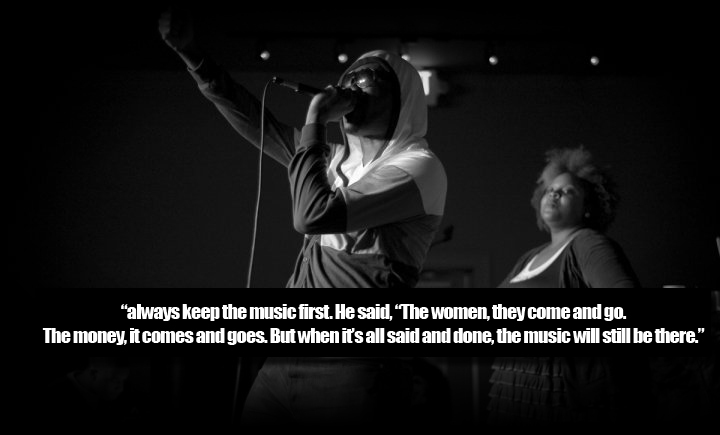 IREPSTL: You often talk about music being your “first lady.” Why is it so important to you? TEF POE:I look at it like this. There’s an old saying from this old guy that used to be in my neighborhood. And he taught me this when I first started pursuing music professionally. He told me to always keep the music first. He said, “The women, they come and go. The money, it comes and goes. But when it’s all said and done, the music will still be there.” And I hold onto that. Like I really think about that almost on a daily basis. You have to learn to be intimate with the music; you have to learn to be intimate with your talent. So like when nobody’s here, or when I’m feeling like I don’t have another human being to relate to, my talent does that for me. I use the music to get all of that out. I told this one girl this: She was like, “You don’t seem too anxious to be in a relationship anytime soon,” and I was like, “I’m not.” I believe that the only true love that I have, honestly, is music. And I explained that to her by saying, you know, when she downloaded Money Never $leeps, a couple other women downloaded Money Never $leeps. They put it in their iPod and go to sleep with it at night. They could be going to sleep with me every night, whether I know it or not! So, that’s all the love I need. This entry was posted in interview and tagged interview, tef poe, the force. Bookmark the permalink. Nice Pictures….can a brotha get some credit? at the very top it says editor note : photography Michael Thomas….its been there since last night when I first read the interview..